We stock the superb Fujitsu NiMH low self discharge rechargeable batteries which are made in Japan, represent fantastic value for money and are increasingly regarded as the very best of the best. 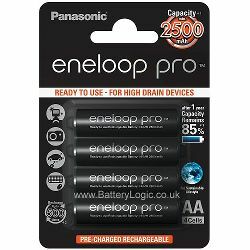 We have been selling rechargeable batteries online since 2003 and in that time have sold several million packs of batteries, in our opinion Fujitsu batteries simply cannot be beaten. All our NiMH rechargeable batteries can directly replace standard 'throwaway' batteries such as alkaline or zinc carbon single use varieties in almost every application. Please note that all 'throwaway' AA, AAA, C and D size batteries have a voltage of 1.5V and all NiMH rechargeable batteries of the same sizes from every manufacturer are rated at 1.2V. All the rechargeable NiMH batteries shown on this page can directly replace throwaway batteries in virtually every application. All rechargeable batteries shown are in stock and available for immediate dispatch. All orders placed before 5pm (mon-fri) are dispatched same day via Royal Mail First Class post.